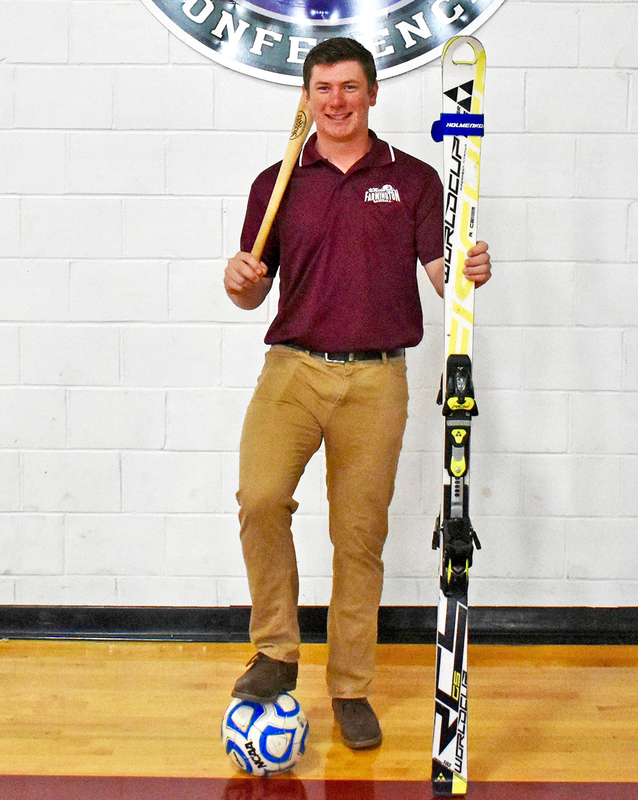 Bolduc played soccer, baseball and skied for Mt. Blue High School and is still participating in all three at the University of Maine at Farmington. 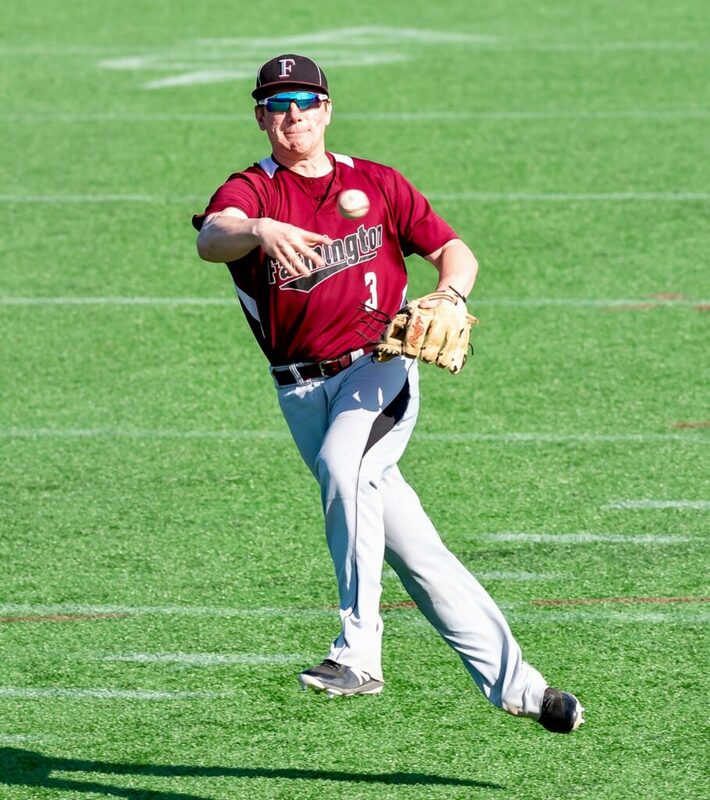 FARMINGTON — Ask three-sport athlete Hunter Bolduc to name his favorite pastime at the University of Maine at Farmington and he will give you a politician’s answer. “Which ever one is in season,” Bolduc, who plays soccer, baseball and skis for UMF, said. “He’s been saying that forever when people ask what’s his favorite sport,” said Michael Bolduc, Hunter’s proud father. Hunter Bolduc played all three in high school and he intends to continue participating in each sport for the next three years at UMF. “That’s the plan,” the 2018 Mt. Blue High School graduate said. But Bolduc knew this Herculean, three-sport endeavor would be physically demanding as well as place unrelenting pressure on himself in the classroom as each season blends into another. “A little bit (of pressure) at first, but once you figure out the time management, it is not as bad as it seems,” Bolduc said. He understood he would be riding a merry-go-round during the entire academic year, but he just couldn’t pass on any one sport. “It is pretty much a year-round thing once you start,” Hunter said. Since he began attending UMF in September, he has had a one-week respite from sports — and that was between the soccer and skiing seasons. Sports, like his passion for the great outdoors, has influenced and shaped Hunter’s life — and giving up just one sport would be like giving up fishing or hunting. Hunter is also an avid outdoorsman, who has spent some early mornings in the woods hunting or fishing before classes have begun. But like being outdoorsman, sports has always been integral role in his life. But seasons change and so does Bolduc, who was determined to excel in his studies while spending his time on the playing field or slopes. The Beavers’ baseball and ski teams began recruiting the strapping lad from Farmington. But soccer was a different story. He was a walk-on who made the cut despite going up against stiff competition. “I was recruited mostly for skiing and baseball. Soccer was more of a walk-on (thing),” Bolduc, who played forward for the team, said. “Hunter began his UMF career as a member of the men’s soccer program,” UMF men’s soccer coach Nathan Kronewetter said. “Starting classes for the first time in college and being asked to perform at a high level on the athletic field is very difficult to do well and requires a large window for adjustment. “Hunter experienced some struggles balancing both hats but ultimately prevailed as a great teammate and an important member in the program. Kronewetter said Bolduc’s venture to play three sports for the Beavers is remarkable. “To play two sports in college is something that many places won’t allow and or encourage,” Kronewetter said. “Each program’s routine is to actively encompass the student-athlete so that they work on that particular sport’s craft year-round. 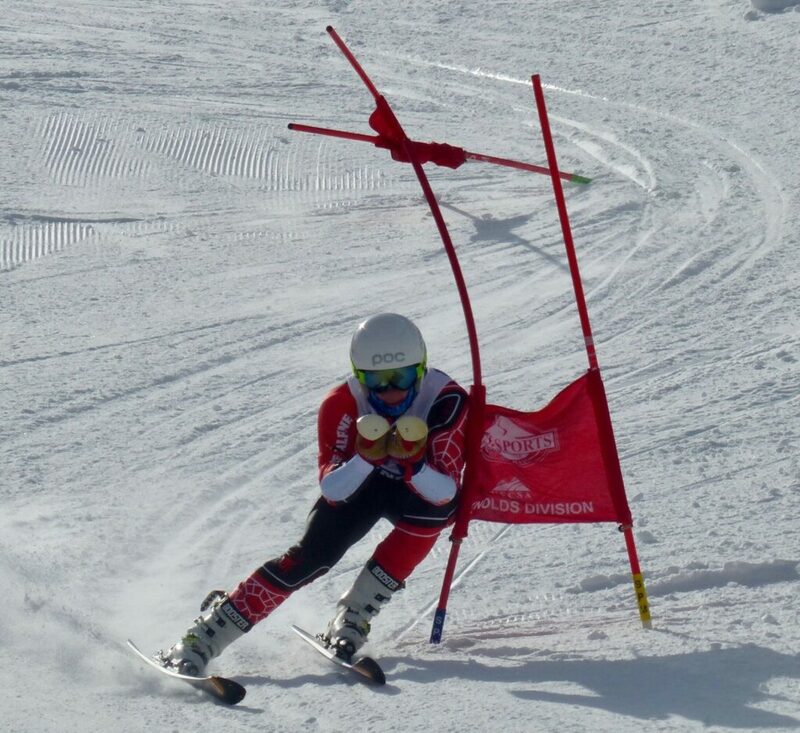 UMF snow sports director Scott Hoisington describes Bolduc as an athlete with a can-do attitude who always supports his teammates and coaches. Bolduc was always fearless on the snowy slopes at Titcomb Mountain for the Mt. Blue Alpine team. UMF offered him an opportunity to remain on the cold, wind-blown mountain as a competitor. But just as the ski season ended, Bolduc found himself in the greener pastures of a baseball diamond. 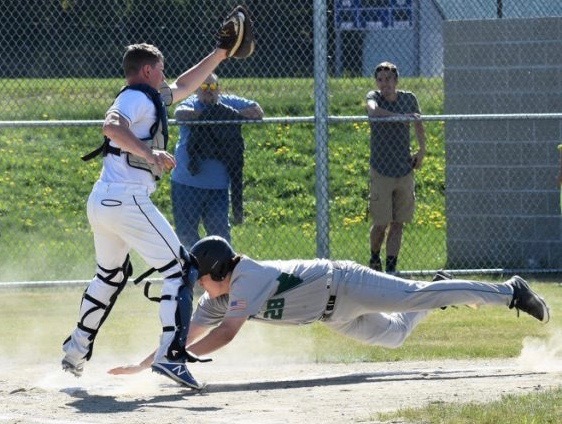 “Hunter started about five weeks after the rest of the team due to participating in skiing,” UMF head baseball coach Chris Bessey said. “He is working hard to get caught up and has shown an eagerness to get better everyday. He demonstrates a good knowledge of the game and a strong work ethic. But Bessey also pointed out that making such a huge commitment to three sports could also take a toll on the academic side for Bolduc. For Bolduc, the university offered him a chance to play sports and still enjoy his other passion — the outdoors. He is studying environmental policy and planning and has his heart set on becoming a Maine warden. Bolduc offers some common-sense advice for athletes who dare to become a three-sport athlete at the college level. “Focus on your time management,” Bolduc said. “Get that figured out early. That makes your life a lot easier. Know what you want to do going into college. Do not wait and think about what you want to do. But Bolduc insists his non-stop schedule doesn’t wear on him. He enjoys leading an active life. Sitting still is not for him. “I think my dad is pretty excited that I can still play all the sports that I love and he likes traveling to games,” Bolduc said. “He came to almost every soccer game this past season even trips to Vermont … he enjoys being able to come and watch. But Bolduc is grateful and understands that’s what involved fathers from supportive families do for their appreciative sons who are making their way and mark in the world.